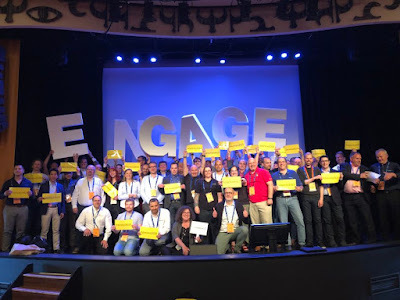 Yesterday I was back from Engage and WOW , it was a HUGE event ! The venerable Theo Heselmans did it again. I admit this was my first engage, so i was part of the 43% of the rookie but during past years I've followed the event remotely so I could only confirm and amplify what I have heard of positive during Engage and his organization during the years. There was a huge presence of Offering Managers from IBM and HCL so we was able to get a lot of info and announcements during the 2 days . HCL teams is full of enthusiasm , they are developing things, they are developing fast and they are hearing feedback from community and customers about the products: excellent ! IBM Connections will continue to evolve during next month , IBM show us some exiting anticipations of the evolutions that will be released during next mont: awesome and exiting. Below the slides from the session I made with my friend and colleague Daniele Vistalli about how Jenkins, Git and Ansible could help a System Administrator in every setup, deploy or configurations. At the end I love to say HI to all my IBM Champion friends ! I've loved to have the opportunity to spend other time with all of you ! See you at the next event !